The rally of Modi can be again rescheduled on December 7. Prime Minister Narendra Modi, who was set to address an election rally in Gujarat’s Surat on Wednesday has been postponed in view of cyclone Ochki, party leaders said. 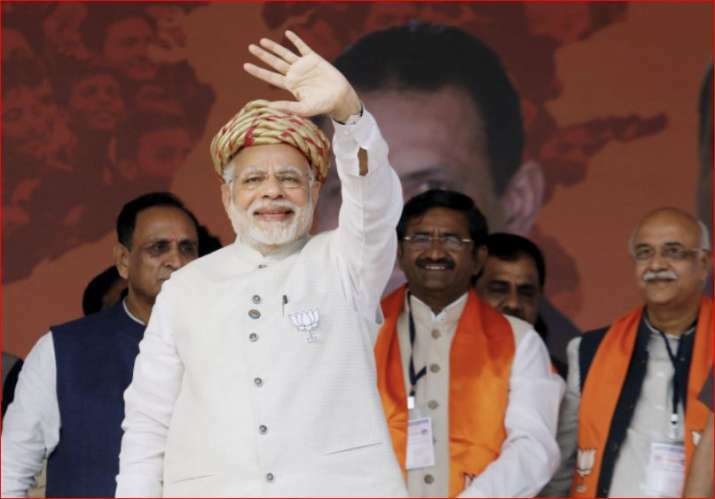 “The Prime Minister’s rally in Limbayat assembly has been postponed in view of the cyclone Ochki,” a Bharatiya Janata Party (BJP) leader told IANS. “With Cyclone Ockhi expected to make a landfall in Gujarat, I appeal to BJP Gujarat Karyakartas to focus on helping people across the state. Our Karyakartas should devote themselves to providing all possible assistance and stand shoulder to shoulder with fellow citizens,” Modi said in a tweet. “Continuously monitoring the situation arising in various parts of the country due to Cyclone Ockhi. Spoke to all relevant authorities and officials. All possible assistance is being provided to those affected,” he said in another tweet. Beside Modi’s rally, a public meeting of Uttar Pradesh Chief Minister Yogi Adityanath and BJP MP Manoj Tiwari in Surat on Wednesday have also been postponed.